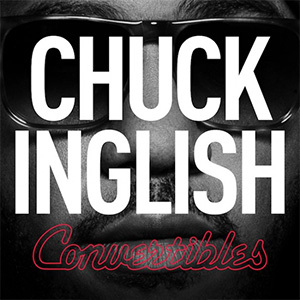 With Convertibles, Chuck Inglish drops an album custom made for summertime. On a beautiful day, driving around with your windows down, you've gotta have something fresh coming from your speakers. Enter: Convertibles. Whereas Chuck's duo with Sir Michael Rocks, The Cool Kids, embodied their Chicago and Detroit Hip-Hop scene influence, Chuck's move to California is evident throughout Convertibles. "Elevators" and "Swervin'" kick off the album with 90s-era G-funk-flavored bass powering the groove. But the album is far from 13-tracks of recycled Gangsta Rap backing tracks. "Legs" featuring Chromeo was released as an early single. Its smooth vocal harmonies, sparse arrangement, and tight drum-and-bass pocket lay a foundation somewhere between Pharrell and Nile Rogers. Convertibles is littered with guest performers who bring to the table a wide assortment of skills, from Jade's colorful vocals to Incubus guitarist Mike Einziger shredding, both bringing life to "P.R.I.S.M." Culling the skills of Inglish and company into a coherent album, Einziger also took on the Executive Producer role. Any way you slice it, Convertibles is a party album that will keep heads bobbin' from start to finish. As a solo artist, Chuck Inglish establishes himself as the engine under Convertibles's hood. But this car is pimped out lavishly from bumper to bumper.